In vertebrates, bodily support and movement requires bones and muscles. Muscles pull and push, contract and relax - and bones respond accordingly. Taken together they form the musculoskeletal system. But, while much is known about each of these system’s disparate parts, less is known about the joining mechanisms tying them together into an intricate whole. 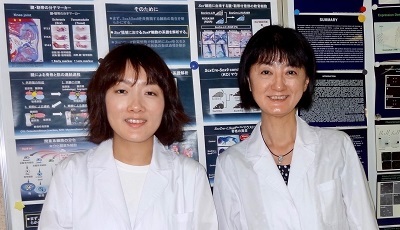 Hiroshima University researchers, keen to resolve these linking regions and develop regeneration therapies based on stem cells, have made a major breakthrough in understanding. Professor Chisa Shukunami, and Specially Appointed Research Associate Yuki Yoshimoto, of HU’s Graduate School of Biomedical and Health Sciences, have found that the Scleraxis (Scx) “transcription factor” – a type of protein controlling production of genetic information in cells – is vital for the embryonic development of muscle-bone joining regions. Scx has already been found to exist throughout embryonic development in tendons – the cords of strong white fibrous tissue that connect muscle to bones, and ligaments - bundles of tough, fibrous, elastic collagen that act as binding and support straps for joints. It is also known to be expressed for a limited time in the specialized cartilage that connects ligaments and tendons to bones. However, the latest study from HU is the first time that Scx’s necessity for maturation of these components has been observed. The HU researchers determined Scx’s necessity by creating genetically modified mice and observing their development in the embryo. 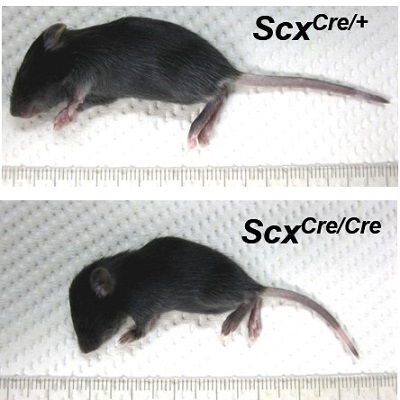 These “ScxCre knock-in” mice, had their Scx expression capabilities modified so they instead produced the enzyme “Cre”. In the embryo Cre was thus produced in the same tissues as Scx would normally be, but without any of Scx’s joint making potential. The developing mice devoid of Scx were then observed alongside developing embryos possessing natural Scx expressing capabilities. Those lacking Scx were seen to be undeveloped in the entheseal cartilage regions – where ligaments and tendons join to bones. This was particularly noticeable in the rib cage, knees, heels, and between the vertebrae, and also in the limbs where the tuberosity – the protruding bits of bone to which muscles are attached - was absent. 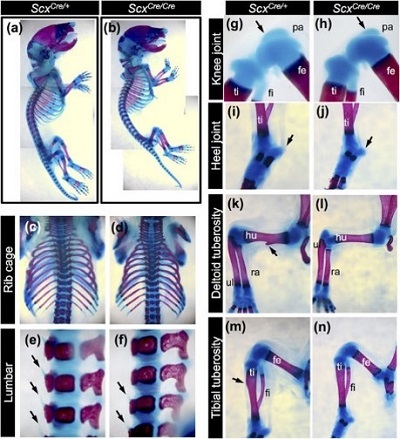 In addition, the cell surface markers, proteins that indicate cell type, for mature ligaments and tendons were missing, and the tendons and ligaments in the knee, back, tail, and heel were all small and deficient. Overall, the mice devoid of Scx developed to be smaller and lacked mass and definition as a result of these undeveloped regions. Compared to ScxCre/+ mouse, ScxCre/Cre mouse is small. The forelimb autopod of ScxCre/Cre KI neonates was locked in a dorsal flexure (arrow). Overall, the mice devoid of Scx developed to be smaller and lacked mass and definition as a result of undeveloped regions. These results highlight the functional importance of both the persistent expression of Scx for the formation of tendons and ligaments, and also that of the short burst of Scx expression that precedes the formation of entheseal cartilage that connects tendons and ligaments to bones. The researchers at HU are keen to employ Scx’s role in cell differentiation to develop stem cell therapies for regenerating parts of the body that are notoriously difficult to repair. Potential applications could include regeneration of worn joints in the elderly, and transplants enabling sports stars to make a speedy return to the field after injuries that could once have ended a career. Find more Hiroshima University news on our Facebook page.